Last year, near the end of summer, just a few months after starting with a few political cartoons on this site, I went online and typed “horse” into the google images search. Then “cartoon horse”, then “unicorn”, you see where I’m going with this. I was looking up reference images for inspiration on how to draw a character that had just trotted into my head. 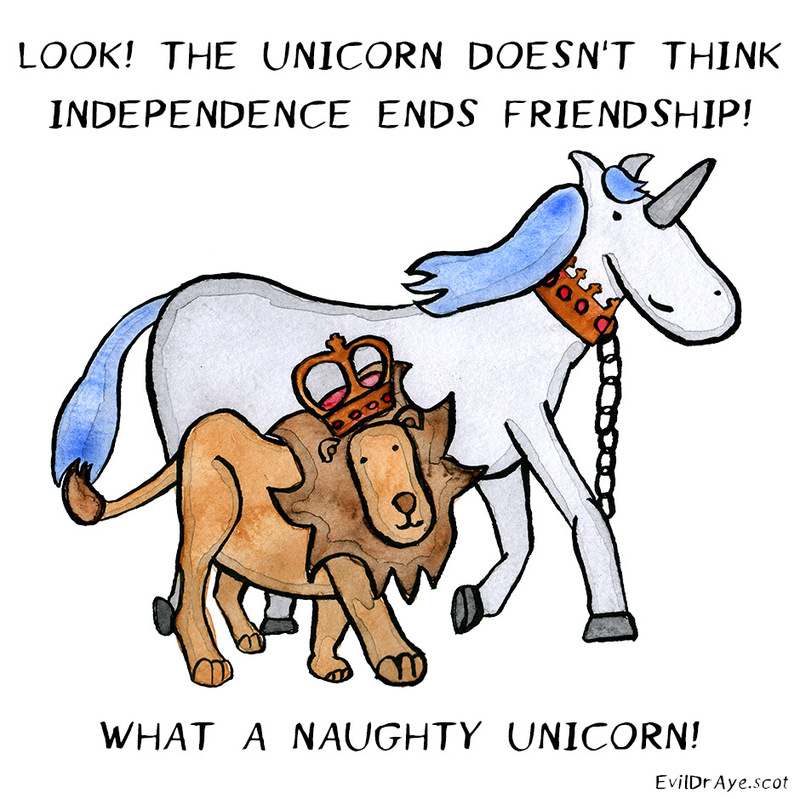 On the 6th of September 2016, the first “Naughty Unicorn” cartoon was published and became an immediate hit on Reddit, where I’d taken to posting my cartoons. It was really quite a simple idea. I took the constant moans about Scottish independence supporters not quieting down, and turned them into the idea of Scotland’s national animal breaking free of its chains, only to have some unseen narrator declare that its wish for freedom from its imprisonment was really rather naughty. What a naughty unicorn. It began a new style of cartooning that I was really wanting to get into, mixing the childish innocence of children’s books, with the harsh world of politics. Political cartooning, with a family feel, as I’ve come to describe my style recently. Admittedly, my excitement got ahead of me, that week became “unicorn week”, with a new Naughty Unicorn appearing on the Scotland subreddit every day. I knew right away that the unicorn might make a really great idea for a book, though, at the time, I’d just assumed a collection of these “what a naughty unicorn” cartoons, all gathered up into one book, maybe with a few multi-panel comics mixed in between the pages. I submitted this, rather dry idea, to Unbound Books, and it was quickly rejected (in hindsight, unsurprisingly). But over a year and two months later, the idea of a naughty unicorn book came rushing back to me as I was reading the Gruffalo (in Scots) to my son. 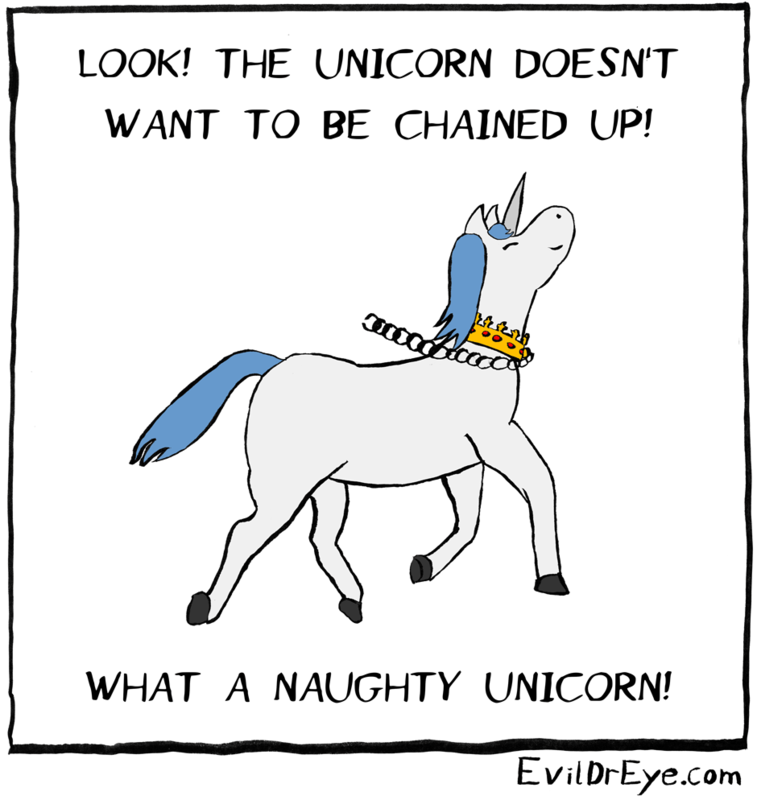 Why couldn’t the naughty unicorn be a children’s book? Not a collection of old cartoons, but something completely original. Well, that is what I am doing. Over the last few weeks, I have managed to come up with a transcript for the text of the book, all based around the idea of the original, centuries old, poem about the Lion and the Unicorn. It continues the poem as the Unicorn awakens and decides it’s time for change. Another page drawn for the Naughty Unicorn book. Only 35ish more to go. Should have started earlier so it could have been ready for Christmas. I’ve already started drawing and painting the pages. Unlike the original naughty unicorn cartoon, which was drawn in ink then coloured digitally, I’m drawing and colouring each page manually in watercolour.